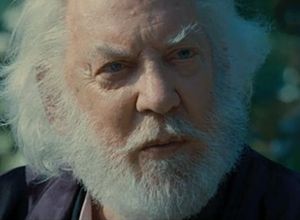 So until today, I have resisted this Hunger Games thing. Everybody has been raving about the books....you've got to read them, they say! I have resisted fearing that we had on our hands, the likes of the second coming of the Twilight Saga. I was wrong. I was tempted to get into the books before this came out, but I resisted for one main reason. I didn't wanted to spoil a decent movie, with a much better book. From what I have been hearing from fans of the book, the movie does justice to the written version, so perhaps my fears were overwrought with memories of The DaVinci Code and Angels and Demons, both FANTASTIC Dan Brown books, both TERRIBLE Ron Howard movies. Would I have liked those movies more if I hadn't read the books? Who knows, but I wasn't going to chance it. So I got up early on this fine Friday, to check out the 9:45 AM IMAX show at my home theater of AMC Barrywoods. I expected a larger crowd, but there were only about 100 in the huge auditorium. It was 9:45, though, maybe too early for some movie goers....for me, it was a great opportunity to AVOID THE CROWD. I am sure the evening showings were an absolute mess! The story is simple, a civil uprising in the world of PAN-AM was quelled in the past by the government. 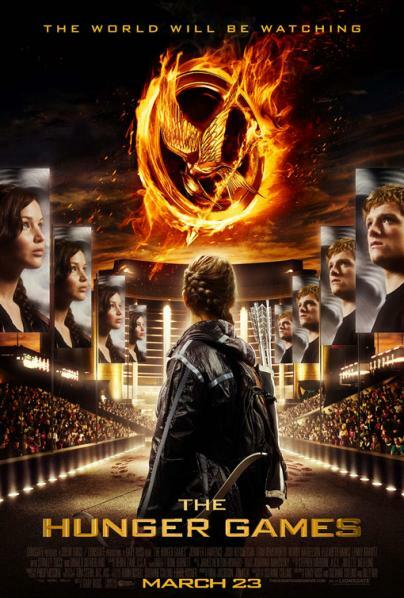 The world consists of 12 districts and as penance for their uprising, each year each district would offer up one young man and young woman as tribute to the Hunger Games. Their names were drawn from a bowl and depending on things you received from the government through the year, your name may be in there more than one time, increasing the odds of your selection. Of the 24 competitors selected for the competition, THERE CAN BE ONLY ONE! (Sorry, that's highlander!) But still it's true, there can be only one winner, in a fight to the death battle arena style competition, in which the arena is this futuristic gaming cage consisting of forests, mountains, fields, and rivers. Lots of places to hide, plan an ambush, or cry for mommy, if that's your cup of tea. This is a sci-fi, fantasy, action, adventure, love-story, but also methinks, it falls into the realm of post-apocalyptic (of sorts) and me likely likely!! 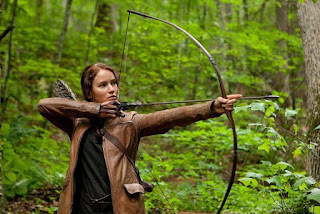 We focus our attention on District 12, where young Katniss Everdeen (Jennifer Lawrence) struggles to survive with her mother and her sister, hunting for whatever she can find them to eat. We meet her early on and we can tell she is quite proficient as a survivor. 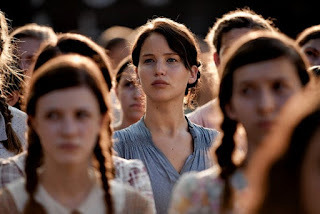 She has a close friend in Gale (apparent man-candy to most young ladies in Liam Hemsworth), who dreams of their families running away together, away from the oppression of the PAN-AM government and their wicked Hunger Games. 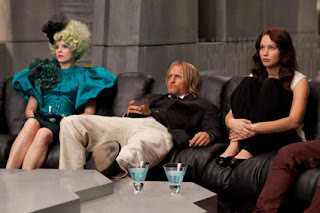 The day of The Reaping (the selection of the tributes) is upon their District,.and the fancy-schmancy Effie Trinket (an almost unreconizable Elizabeth Banks) is their to lead the ceremonies as the District's liaison to the games. Katniss has a younger sister, Primrose, who is in shambles because this his her first year with her name in the bowl. Of course, the odds are stacked way against her being selected because the older you are and the more in debt you are to the government, the more times your name is in that bowl. As fate would have it (and for the sake of good storytelling! ), of course young Prim is selected. With that event, District 12 is then presented with its first ever volunteer for tribute in Katniss stepping in to take the place of her much younger sister. Peeta Mellark (Josh Hutcherson), the son of the town baker, is selected as the male tribute. The two are given fleeting moments to say goodbye to their families, and then they are off to a two week stretch of pagentry, celebrity, training, and then the ultimate fight to the death. On their travels via a high speed futuristic floating (magnets?) train to the capitol city, they meet their "mentor," a former Hunger Games champ, Haymitch Abernathy (Woody Harrelson). On the train, the are regaled with lavish food and hospitality. 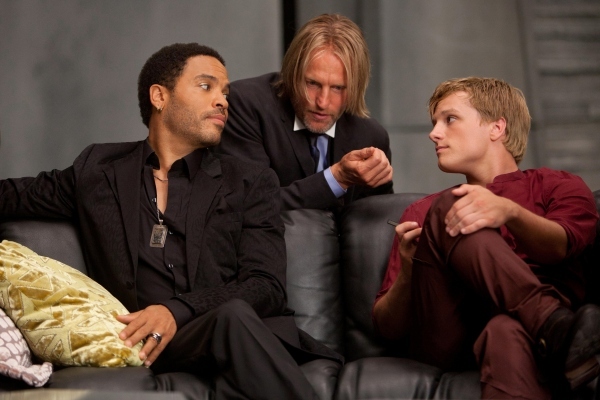 Haymitch is not so eager to begin their training, as he is quite jaded by all this, but he quickly comes around to their cause. Once they arrive in Capitol City, they are each given a handler to make them presentable. Katniss has the good fortune of hooking up with Lenny Kravitz himself, who turns out to be a master of style and panache. The supporting cast of adults, Kravitz and Harrelson included, are all matched to their characters perfectly. From Stanley Tucci's jovial host of the Hunger Games talk show, attended by thousands, to the game designer, Seneca Crane (Wes Bently), who has by far the beard of the year in any movie to date. The enigmatic Donald Sutherland is perfect as the soft spoken, man of little words but harsh glances, President of Pan Am. After the selection of the Tributes is complete, they are presented to the audience of thousands who have gathered for the Games. In this process, they have the opportunity to impress folks and possibly garner sponsors that may send then needed items that may aid them during the Games. There is a training session, some get to know our characters time, and by the midway point in the film, much to my happiness, the games begin. This is a PG-13 film that features a competition of battling to the death. This is mostly a bloodless battle film, but the skill in overall presentation makes you the viewer, forget how mild the violence is, compared to what it could be, ala say, The Running Man. The game site is a beautiful landscape, that is controlled precisely by a computer control room, meaning the game designer can affect the outcome, insomuch that he tries to goad the Tributes into combat when there are lulls in the competition. This film reminded me of sorts of Firefly, the cult classic Whedon series, in that there is a seamless combination of high-tech sci-fi concepts intermingled with old world, outworld type of Macgyver tech, designed on the fly so that the competitors can survive. This is an out an out adventure film. Jennifer Lawrence is a very strong lead and Josh Hutcherson holds his own surprisingly well. I was quite surprised at the lack of screen time for Liam Hemsworth, but from my understanding, he becomes more prominently involved in the subsequent entries in this violently popular trilogy. 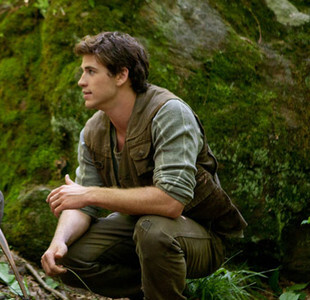 I learned from a co-worker today that Jennifer Lawrence and Director Gary Ross, in an interview on NPR, revealed that each day brought an hour hike in and out of the very rural set that was used for the Games grounds. That is really something...piggyback rides anyone? Sherpas? Hopefully they had some kind of a hookup! The screenplay was written by the novelist, Suzanne Collins, Billy Ray, and the Director. I think having Collins on board is what has helped keep everyone so happy, but for my money, they knocked this story out of the park! There were some very touching moments and I thought the selection process was especially heartfelt, as even though we had only met our characters for a few moments before we learn that Katniss will be the D12 warrior, her loyalty to her family and friends is absolutely palpable. The story is well told from start to finish and I am very much looking forward to the sequel! The big question is, now that I know for sure that I will read the first book, will I be able to keep from reading Catching Fire and Mockingjay in the interim? The critics seem to love this film, the audiences seem to love this film, the fans of this book seem to love this film and you know what, I loved this film. I enjoyed it from start to finish and I certainly was glad to have caught it on the IMAX screen, as it is limited in that regard, playing only one week on the super-duper big screen. 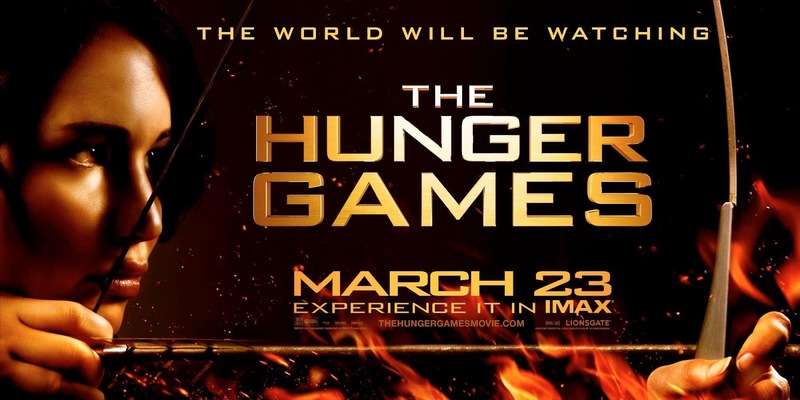 I wonder if the theaters will be happy that Hunger Games gets bumped by Wrath of the Titans next week? Hunger Games set the midnight record for a non-sequel opening, I think it will be tough for the Titans to knock off Katniss next week! THERE CAN BE ONLY ONE!!! 4.5 of 5 HORNS for this fine flick! It's a quick read and it is worth it. I really used to love short stories in English and Lit classes! The Most Dangerous Game, The Tell-Tale Heart, The Cask of Amontillado, and so many more! Such great tales, told in so few words! **Thanks to Hermione for pointing out my mistake...it is in fact Panem, as opposed to Pan Am, which I thought it was. Oops! None the less, thanks Hermione! 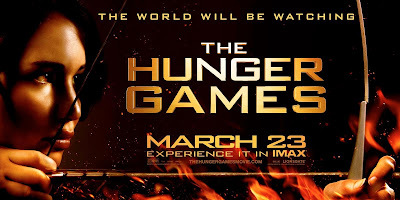 I was disappointed with the Hunger Games. It kinda reminded my of Gamer with Gerard Butler, but a less violent. Story reminded me of The Lottery with a bit of Romeo and Juliet with a touch of 1984. It was a little weird and though probably not me type of literature, I think I would have had more appreciation had I read the book first.